My name is Shannon Kocka. 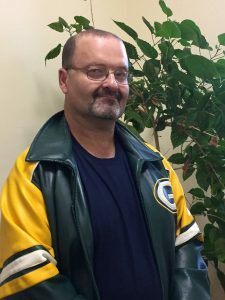 I am a resident in Hayward, Wisconsin, and a graduate of the Hayward High School. I was diagnosed with Aspergers Syndrome (a part of the Autism Spectrum) when I was two years old, and I’ve been very shy, and self-conscious ever since. I never wanted to try anything new, the mere thought of trying new things makes me panic and sick to my stomach to this day, I have speech impediment, and there are days where I will stare off into space either out of boredom or depression. I’ve had people helping me over the years, though. Friends, family, even old teachers, they were always teaching me to move forward. On some days it works and I feel like I’ve accomplished something big, while on other days I just sit and mope. If I had the choice to get rid of my autism, though, I wouldn’t take it. Autism and Aspergers isn’t a disease, it’s made me who I am today, and so it’s a part of me. Without it, I think I would be much less imaginative or interesting. I love to watch movies; I am the movie person of my family, as well as playing specific types of video games, and listening to music. Music often helps get my imagination going, even if most of it is spent on daydreaming on my part. My other hobbies include reading, writing, drawing, and spending time with friends on the Internet. To develop my independence, and social skills I’m employed at Marketplace foods as a bagger. It was scary to interact with so many people at first, but I’ve gotten used to it over time. My dream is to become an accomplished writer and author, I have already written and published one book, and I hope to follow it up with more to come. In fact, I have published one book already. It is called “Wings” and I hope to make a trilogy out of it. “Wings” is only available on Amazon.com. If you are interested in dragons and fantasy worlds, then hopefully this is the book for you. I started doing abstract art about seven years ago. Drawing helps me cope with my PTSD, and what’s going on in my daily life, and my emotions. I never know when I start a picture, how it is going to turn out. A lot of it is freehand, but in some pictures I do use a protractor. All of my art is done with a sharpie marker. Click here to see Michael’s Gallery. I lived in Northern Minnesota until I was in first grade; my family then moved to Northern California where I resided for many years. Throughout my early education I did not have any art classes. I became interested in art after having two major life saving surgeries and other medical problems. My disabilities are both physical and mental. I have a rare disease of achalasia and other medical challenges. While in the hospital, I bought a calendar. When I looked at the pictures for the month of June, there was a picture of the Brule River! I had been to the Brule River because both of my parents were originally from small communities on the South Shore of Lake Superior. After recuperating from the hospital, I moved to Washburn, Wisconsin where I met and took two pastel classes from Diana Randolph. My first pastel painting was the Brule River. I also started taking watercolor classes from Wei Lan Lober. I take Wei Lan’s watercolor classes at Karlyn’s Gallery in Washburn. Everyone at the Gallery is welcoming and they are always glad to see me. Taking art classes has influenced my life, painting has helped me to have enjoyment and courage to do other things. Also, Lillian Hipp, a friend from class has taught me how to do Sumi-e painting. She took several days to show me this new technique. My biggest honor is that I sold my first painting! It is on display at the Northern Lights Rehabilitation Center in Washburn. At one time I was an elementary school teacher. I miss being in the classroom, but now I have found that I am learning about different art styles and exploring a variety of art mediums. I especially enjoy watercolors and coloring. I am so glad to have met many people in my classes who have helped my anxiety by being friends and knowing they care about me. Art has had a positive influence in my life because it soothes the soul inside me. Click here to see Mary’s Gallery. Giizhik was diagnosed with autism at age five. He began his artist’s journey at age six with his first Holiday card titled “Christmas Story.” Together with his younger brother, Mino, he now has a collection of 12 prints. 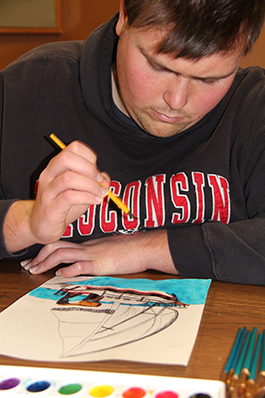 Over the past seven years, Giizhik’s and Mino’s Holiday Cards for Autism have raised over $16,000.00 to benefit autism research at the Waisman Center at the University of Wisconsin, Madison. On Friday, January 20, 2017 he was honored by the Waisman Center. 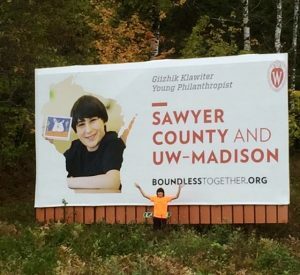 Giizhik was also chosen as the Sawyer County representative for the University of Wisconsin Madison, All Ways Forward Campaign. His billboard is located on the left side of Hwy 63 north as you are entering Hayward. Today, Giizhik is an engaging young man of 14 years. He enjoys many hobbies including drawing, finding licensed collectibles, watching cartoons and movies. Some of his favorite animals are deer, rabbits, cats, and kangaroos. His cartoon favorites are Looney Toons, Tom & Jerry, and Ren and Stimpy. 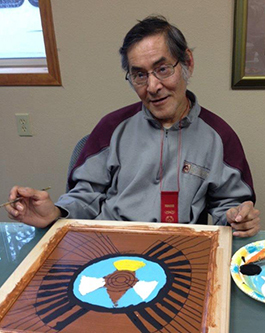 Giizhik continues to use his artistic talents to reach and inspire others. He would like us to remember to revel in the smallest of joys and search for the hidden treasures in every child. It is our hope that with each dollar raised, we come one step closer to solving the autism puzzle, one card at a time. Elias is a nice young man from Hayward, Wisconsin, who has anger issues associated to being on the Autism Spectrum. One way he calms himself is put the pencil to the paper, whether it be writing it out, or drawing pictures. Elias works hard on his drawings, sometimes starting over several times to get a particular design or facial expression how he wants it to look. 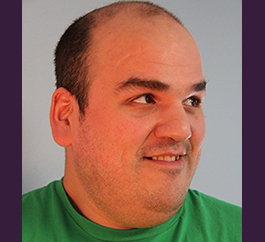 One of Elias’ passions is “gaming” – playing video games on his Xbox One and Wii. He enjoys being able to design the attire and gear his characters wear and use in these games. Often times spending more time designing than playing. Elias is an active young man, who enjoys riding his bike. He hopes to get strong enough to ride to Duluth with his dad one day. Elias runs track & cross country for Hayward High School. Elias has a summer job of mowing lawns for his parents’ rentals as well as for the American Birkebeiner Foundation in Hayward. Elias says, “The people at the Birkie are always in a good mood.” which Elias likes, as he does not always feel his peers are as nice as adults. He is very articulate and often times is able to verbalize his thoughts into eloquent prose. He has no problem speaking in front of a crowd of people. 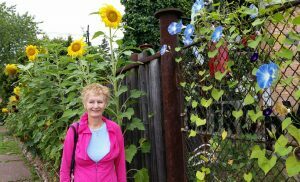 Carla is an energetic, friendly, curious woman who has faced and overcome many obstacles in her life. She is the youngest of eight children. She entered school with enthusiasm and interest, and a wonderful caring, skilled first grade teacher. That experience however did not last and after first grade and the support of such a skilled teacher she soon had to face the world of ?bullying, lack of teacher support, and teasing. To make things more challenging, her mother was stricken with cancer when Carla was just seven years old. At that time her older sister came home to help with the young family and her mother died a year later. 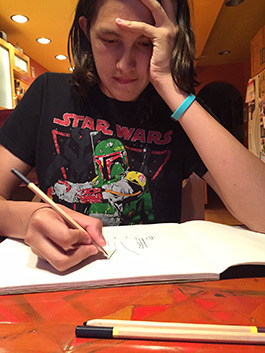 Carla continued with her schooling getting help from Special Education Classes. She moved to Cable and attended Drummond Middle School and some High School. When she was in tenth grade she attended a Residential Treatment Center. This was very difficult for Carla. It was hard for her to be away from her family and the people she loved. The challenges for her at the Treatment Center did not help her in any way. She returned home at the age of eighteen, not having finished high school, and a lost soul. But, she didn’t give up. Through her many struggles and challenges, many of which are related to her diagnosis of autism, she has emerged a beautiful person. 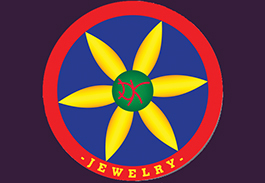 Carla now lives in her own home, has her own yard care and dog care businesses, finishes and sells Diamond Willow Sticks, and is a dedicated member of the Cable Community. She helps her sister in their Garden plot at the Cable Community Garden and is a Chicken Tender. 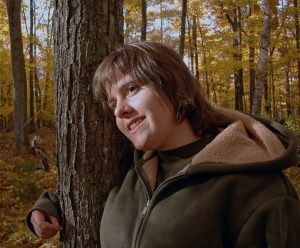 She is a member of People First of the Northwoods, a State Board member of People First Wisconsin, has participated in Special Olympics WI and won many awards in Track, Swimming, Skiing and Basketball. We cannot overlook the interest she has in sports and is an avid, loyal Packer Fan. She is also a member of SMART…See My ART! 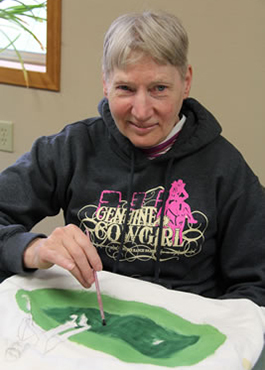 She has participated in SMART Events for many years and exhibits year round in the SMART Gallery at The Rivers Eatery in Cable WI. 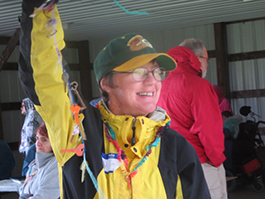 Some of Carla’s favorite things are visiting, observing nature, gardening, volunteering and helping others. She loves hunting and hunts with her friend Matt Schwantes and is so wanting that trophy deer! Carla is supported by the Cable Community, St. Ann’s, her sister Cec, and IRIS. April has lived in Washburn, Wisconsin most of her life. 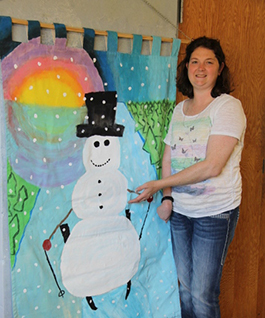 It is there that she works at the IGA grocery store and tirelessly gives of her time to Faith in Action, Big Top Chautauqua, and the Ashland Elementary School as a volunteer. In her free time, April loves hiking and spending time with her friends. April’s primary medium of art is photography. For the past five years she has been developing her composition skills through photographing friends, family, spectacular scenery found in Northern Wisconsin, and the breathtaking images of the four seasons. 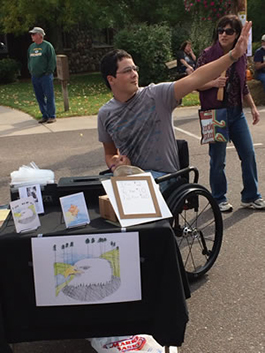 April’s work has been shown at the Bayfield and Ashland County Fairs, M&I Bank, BMO Harris Bank, the Washburn Cultural Arts Center, and the Black Cat Coffee Shop in Ashland. 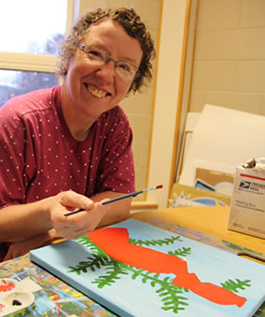 She was the featured Artist of the Month at BMO Harris Bank in July, 2015. You can see examples of her photography here. Click here to see Charlie’s gallery. Click here to see Drakito’s gallery. Larry lives in Ashland, Wisconsin. 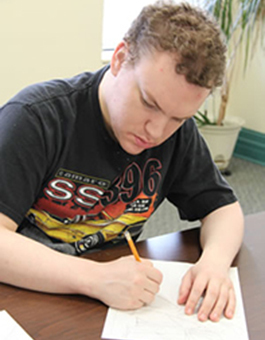 He has an Intellectual Developmental Disability and needs to have his time structured. 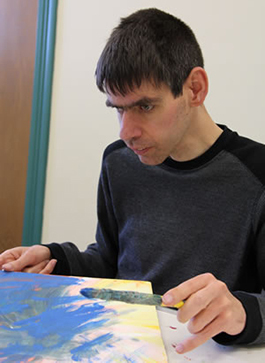 Larry has been an artist for eight years and works with an art therapist at the Vaughn Public Library. 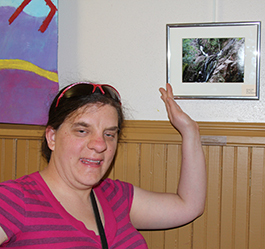 Larry’s art is shown at the Rivers Eatery in Cable and at the Vaughn Public Library in Ashland. His sister has one of his paintings hanging in her office. Besides art, Larry likes to ride on a 4-wheeler with his dad, go paddle boating and go camping with his family. He goes to church on Sunday and volunteers his time at several area churches. He helps with shredding paper in several offices, and he picks up litter in the parks for the city of Ashland. Click here to see Tony’s gallery. Click here to see Floyd’s gallery. Click here to see Karen’s gallery. Click here to see Pam’s gallery. Brett lives in Watertown, Minnesota where he designs tattoos, plays poker and cracks jokes at the local watering hole. He aspires to win the World Series of Poker competition someday but for now plans to make ends meet by selling his art work. 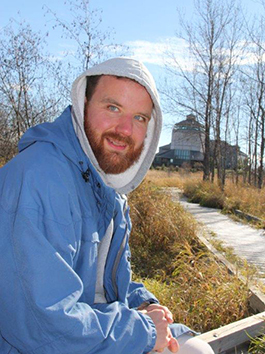 Brett is determined to live life to the fullest and will not let physical challenges stop him. He attended college and took a class in computer graphics. He learned enough design skills to make his own graphic art. To commission work or to purchase my designs, email me at designsbybretthb@gmail.com You can also visit my Facebook page here. 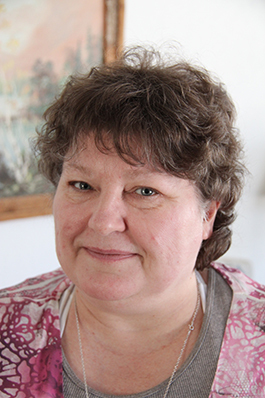 Renee lives in Ashland, Wisconsin where she enjoys her nine beautiful grandchildren. 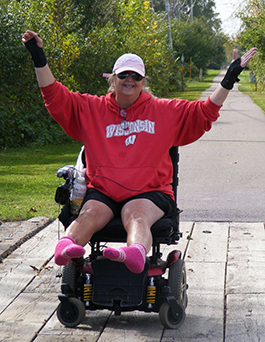 Renee lives with Reflex Sympathetic Dystrophy causing her constant pain, difficulty sleeping and depression. Click here to see Renee’s gallery. Click here to see Deanna’s gallery. Click here to see Annika’s gallery. Click here to see Cody’s gallery. Click here to see Ole’s gallery.